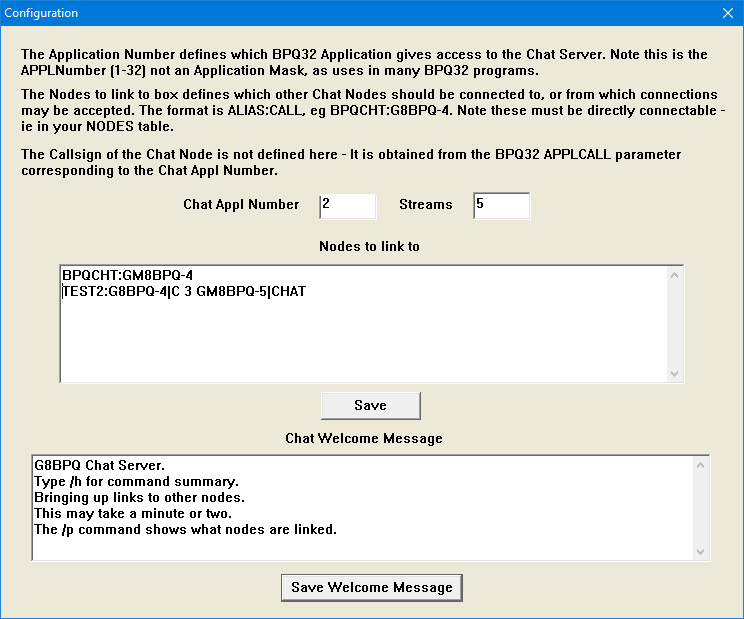 BPQChat is a Networked Converse/Chat server for the BPQ32 system. 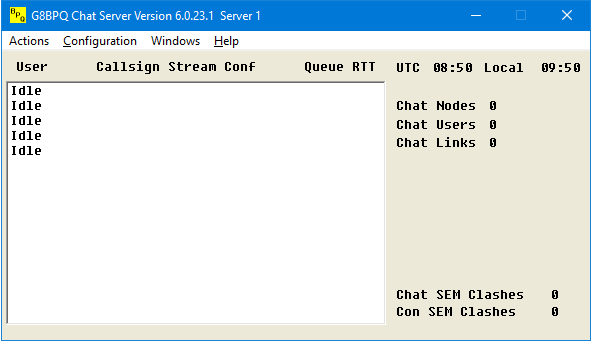 It supports a number of separate chat channels or "chatrooms", called topics. Users initially are connected to topic "General", but may move to other topics , or create new ones if desired. Intenally it operates in the UTF-8 character encoding, allowing use of different languages. Output is also normally in UTF-8, but if a ussr is connecting using a terminal that only supports 8 bit charater sets he can turn off UTF-8 output, and select whech Code Page he wishes to use. You must specify Chat Appl Number, which must match an APPLICATION entry in your bpq32.cfg, and the number of streams to allocate to Chat. This controls the number of chat sessions supported, both User and Node-Node. If you want to link to other BPQ Chat Nodes, enter their NETROM Alias and Callsign in the "Nodes to Link to" box. You can only link to other Chat Nodes if they are in your NODES list. Normally you should not link to more than two or three other Chat nodes. You must ensure that the node you are linking to also defines you as a "Nodes to Link to", otherwise a lot of useless traffic will be generated as one end repeatedly tries to bring up the link and the other closes it. If you wish you can enter a customised Welcome Message which users will receive each time they connect to Chat. All commands start with a /. Any text not preceeded with a / is sent to call connected users in the current topic. /T Name - Join Topic or Create new Topic. Topic Names are not case sensitive. /A - Toggle Alert on user join. /C - Toggle Colour Mode on or off (only works on Console or BPQTerminal. /Keepalive - Toggle sending Keepalive messages every 10 minutes. /ShowNames - Toggle displaying name as well as call on each message. /Auto - Toggle Automatic character set selection. /UTF-8 - Toggle Character set Selection - UTF* or 8 bit. /CodePage (or /CP) Select Code Page to uue when UTF8 is not selected. /Time - Toggle displaying timestamp on each message. /S CALL Text - Send Text to that station only. /F - Force all links to be made. /K - Show Known nodes. /B - Leave Chat and return to node. /QUIT - Leave Chat and disconnect from node. 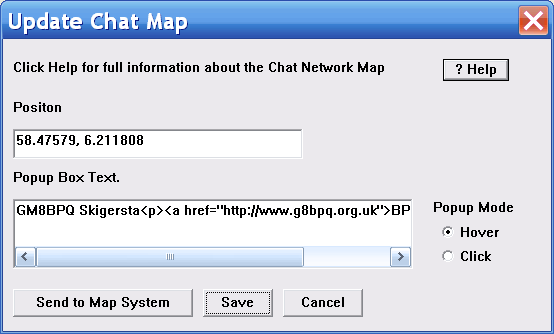 A web page is maintained showing the status of the Chat Network. It can be seen here. If you have an AXIP link you will send a message to the system that maintains the map whenever your chat links go up or down, or every 10 minutes. The map system will create an icon for your station, positioned at Lat 0 Lon 0, and with a popup text of your Chat Node callsign. To update with with your real position and your own popup text, use the Actions/Update Chat Map option from the main window. The Latitude and Longtitude values may be separated by a space or comma. This will transmit your infomation to the Map Server. This is sent as a datagram, so could be lost. If your update doesn't appear on the map after about a minute, check the postion format and resend. Note that if either the position or Popup text fields are empty, thet value will not be changed. If you wish to remove the popup text, enter a single space. Saves the postion and popup information.